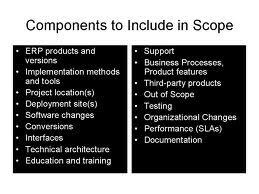 According to www.projectscope.com, “The Project Scope pertains to the work necessary to deliver a product. Requirements and deliverables define the project scope, and it is critical that the stakeholder is in agreement with the information discussed in the proposed plan. Scope creep happens when items are forgotten or all of a sudden a client “needs” to have something included. 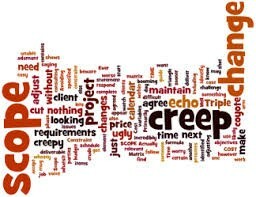 While I do not have a specific project with scope creep I am reminded of scope creep in a movie: Father of the Bride 2. The father, George Banks, has a “room” to build on to their house for their new mid-life bundle of joy. They have the help of a quirky designer. As things turn up, more stuff is added into the addition yet there does not seem to be a meeting of the minds with those issues. Time is not too much of an issue but each added “thing” brings the budget OVER budget. George does not find out the final price tag in the movie as the designer does not hand him the bill until later in the film after he is shown the baby’s new room. It seems they thought of everything to put in the room except the kitchen sink. Had I been managing the project, one of the first things would have been to have a firm hold on the budget. They went overboard on the size of the baby’s room. Unless they had plans for that area later, they might have scaled down, made a room with a walk in closet and a nice bathroom, or made 2 bedrooms and an en suite bath between the rooms with the size of the room. In order to control the “creep”, they could wait until later to put “everything” in the room or wait until after the baby shower (I do not remember if they had one in the movie). Looking back at the movie, even though this is a room for a child late in life, they could have spent less on “stuff” and put some of the money in a college fund. It would have been more prudent to remodel the eldest child’s room as she no longer lived there. In this manner, they could have saved more money and possibly have come in under budget. This example is too cute! I believe you are correct, the couple could have the additional funds and put it in a college fund instead of using the monies on stuff. In completing a project, it would be great to remember that the focus should be to remain within the budget and that is the one thing that will keep a project from completion status.